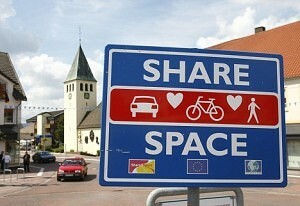 If you find yourself crossing the road in the German town of Bohmte, look both ways – and then perhaps check again. It has scrapped all its traffic lights and road signs in a radical experiment designed to make the streets safer. Yesterday, the local council said the scheme was a complete success. In the four weeks since the signs were ripped up, there has not been a single accident. Officials wanted to test the theory that the 13,000 drivers who use the town every day would take extra care and show each other greater consideration if they were not told what to do. They secured a £1.8million grant from the European Union to set up the scheme in the town near Hanover. Four weeks ago, Bohmte banned traffic lights and warning signs, including those instructing drivers to give way or stop. 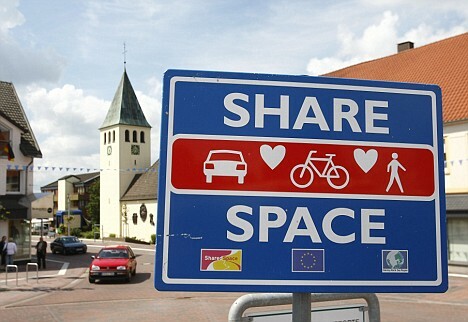 Only two rules remain – drivers cannot go above 30 mph, the German speed limit for city driving, and everyone has to yield to the right, regardless of whether it is a car, a bike or a mother with a pushchair. Officials revealed there have been no shunts, bumps or pedestrian injuries in the month since the scheme started. Previously, there was at least one serious crash every week and scores of lesser ‘fender-benders’. Peter Hilbricht, a police officer in charge of traffic planning, added that the main intersection generated about 50 accidents a year before the changes. The EU has subsidised similar programmes in seven cities across Europe. Exhibition Road in London has been due to become a ‘shared space’ for the last three years. However, funding is an issue and the scheme is not expected to start until next year. One unexpected bonus of the trial in Bohmte is that the town is saving £5,000 a month replacing and repairing signs damaged through normal wear and tear or by vandals.